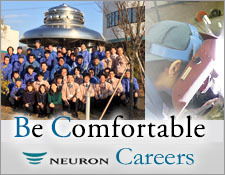 Neuron Japan (hereafter “This Company”) shall, adhering to the following stipulations, take great care in handling personal information, and protect customer privacy. 1. When This Company provides services to the customer, necessary information such as the customer’s official company name, address, name, telephone number, fax number, email address, etc. shall be collected. 2. Personal information received from the customer by This Company shall be managed appropriately. *Personal information refers to information which can identify a particular customer such as company name, address, name, telephone number, email address, etc. 3. At This company, a customer’s personal information shall not be provided to a third party without the customer’s approval, except in cases with a basis in the Personal Information Protection Act or other laws etc. When providing a third party with personal information when delivering products etc., personal information shall be managed by a non-disclosure agreement etc. to ensure no leaks etc. from the third party. 4. At This Company, if a customer wishes for the disclosure/correction/addition/deletion of personal information, This Company shall comply promptly upon receiving communication. 5. Japanese law shall apply to customers’ personal information retained by This Company. Furthermore, This Company shall comply with laws applying to personal information, and shall carry out changes to items as required by changes to laws etc. 6. At This Company, we shall put individual information managers in place for customers’ personal information, and by putting in place appropriate and reasonable safety measures, work to protect against falsification/malicious access/loss/destruction/leaks, etc. 7. At this site belonging to This Company, every effort is being made to the maximum degree to protect customer privacy. However, as the third-party companies whose links are given are outside of the scope of This Company’s responsibility, they will conform to the privacy policies set by those third-party companies.